Sophomore right-handed pitcher Travis Lakins (1) delivers a pitch against Illinois on May 2, 2015. OSU lost, 6-5. After a strong regular season concluded with a rocky finish, the Ohio State baseball team is looking to find its way again in time to play deep into the postseason. OSU (35-18, 13-11) lost eight of nine Big Ten games to wrap up the regular season after starting 12-3. Those included sweeps at the hands of Illinois and Indiana, with a lone victory against Maryland sandwiched in between. Senior catcher Aaron Gretz said despite the results of the last three weekends, the team is not far off from where it was when it entered the national rankings in late April. After concluding the regular season with a double-header sweep at Indiana, Gretz and his co-captain, fellow senior catcher Connor Sabanosh, called a players-only meeting to get things straightened out. “Aaron and I got the guys together and just kinda said ‘Look, we have to take a deep breath and relax. The season’s over now, we’re in position to win the Big Ten tournament, we can hang with any of the eight teams here,’” Sabanosh said. Gretz said the team had been playing with a chip on its shoulder all season after being picked 10th in the Big Ten in the preseason coaches poll, but it lost some of that edge once it began to gain respect. Gretz attributed the loss of that edge as a reason for the recent struggles, and something the Buckeyes need to find again before their season is over. OSU will enter the tournament as the No. 7 seed, with a first-round matchup against second-seeded Iowa (38-14, 19-5), whom OSU did not meet with during the regular season. The double-elimination tournament will then see OSU play either the winner or loser of No. 3 Michigan and No. 6 Indiana, depending on the results of OSU’s game. OSU coach Greg Beals said sophomore right-hander Travis Lakins (4-4, 3.99 ERA) will take the mound against the Hawkeyes, who are scheduled to counter with junior right-hander Tyler Peyton (6-4, 3.32). Lakins is set to be followed by senior left-hander Ryan Riga (5-3, 3.10) in the second game. If OSU avoids elimination in the first two games, however, Beals is not sure who will get the start. He said sophomore left-hander Tanner Tully, who gave up eight runs in each of his final two starts, is dealing with forearm soreness and will be re-evaluated later in the week. If Tully is unable to go, Beals said it will be redshirt freshman right-hander Adam Niemeyer getting the nod. 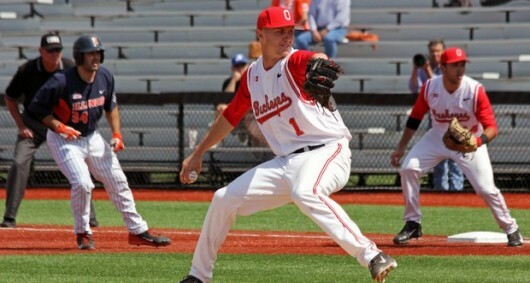 Another injury to OSU’s pitching staff came at Youngstown State on May 12, when freshman Jacob Niggemeyer left the game after just three pitches. Beals said the right-hander suffered a shoulder injury and will not be available in the Big Ten tournament. Despite the flood of injuries and the recent high level of competition, Beals said he believes it is a mental issue more than anything holding the team back in recent weeks. Gretz said the team is feeling less pressure heading into the tournament — and is prepared to take its coach’s challenge. “We’re ready, we know what it takes and we’re going to get it done,” Gretz said. First pitch in OSU’s Big Ten tournament opener against Iowa is set for 2 p.m. on Wednesday at Target Field in Minneapolis.